This entry was posted on Monday, July 26th, 2010 at 1:00 AM by Alicia Kachmar	and is filed under News. You can follow any responses to this entry through the RSS 2.0 feed. You can leave a response, or trackback from your own site. What a brilliant idea! When the earthquake hit, I wished I could do something about it, but thought that my hat-crocheting skills would be of no good to a tropical island. Sleeping mats! I’m going to have to get on that wagon! 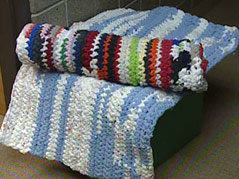 Are there instructions on how to turn the t-shirts into the ‘crochetable yarn’ to make the mats? I would love to see if I can make one. Yes I would also like to know how to turn the t-shirts into the yarn they’re describing. The earthquake, and the brutal aftermath sent my little gears to spinning. My thoughts were along the line of introducing crochet to the Haitian people as a method of making some money. I did a bit of research, and depending on what source you choose to believe the average Haitian lives on somewhere between $200.00 and $600.00 a year. I know of organizations which have been able to assist others climb out of desperate poverty using crochet and knitting frequently with yarns donated by some of the larger yarn manufacturers. I realized I didn’t possess the skill sets necessary to organize such an effort, and some people in the community more experienced in similar projects, and in whose opinions I have a degree of faith, didn’t recommend I try further, frankly I didn’t get a lot of positive feedback. Not that the project wasn’t worth pursuing, but because it would take Billions of Dollars to pay the bribes necessary to get such a project off and running in Haiti. This is so far outside my area of expertise, I just don’t know. I do think several $4.00 pot holders a day might help a lot with someone living on a couple of hundred a year, and could only go up from there as skills improve. I have started collecting t-shirts and will be making mats to donate, how do I get in touch with Pastor Pat Eidsness at Peace Lutheran Church so we can coordinate? I think this is an awesome venture for such a worthy cause.